Calcifications that are linearly distributed are arranged in a line and may have branch points. Segmentally distributed calcifications suggest deposition of calcification in a duct and its branches. This type of calcification may be secondary to benign or malignant processes. Regionally distributed calcifications are most likely due to benign processes. These calcifications are scattered in a large volume of the breast and do not necessarily conform to a ductal distribution. 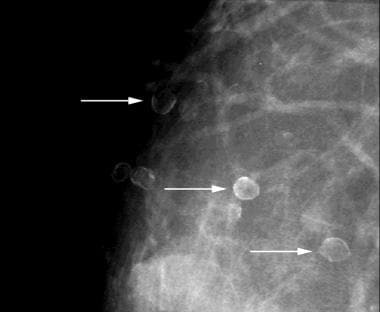 Diffusely distributed calcifications are scattered randomly throughout the breast. The ACR BI-RADS lexicon enables radiologists to use similar terminology to describe mammography findings. This lexicon facilitates data tracking and provides clear management and follow-up recommendations to referring physicians, allied healthcare providers, and patients. Category 6, or "known biopsy-proven malignancy-appropriate action should be taken," is "reserved for lesions identified on imaging study with biopsy proof of malignancy prior to definitive therapy"
Typically, benign calcifications will be placed in ACR BI-RADS categories 1 and 2. Sometimes, these calcifications are initially placed in ACR BI-RADS category 0 and, after additional imaging evaluation, are found to have benign features. Early in their development, calcifications (eg, vascular, dystrophic, or lucent centered calcifications) may be indeterminate; these are often followed at short intervals to establish or confirm their etiology (ie, BI-RADS category 3). Mammograms should always be interpreted on dedicated high-luminance mammographic view boxes or viewers, and a magnifying glass should be used routinely. Extraneous light and glare should be eliminated for optimal viewing conditions. Mammograms should be arranged in the same manner at each interpretation session to minimize left-right confusion. 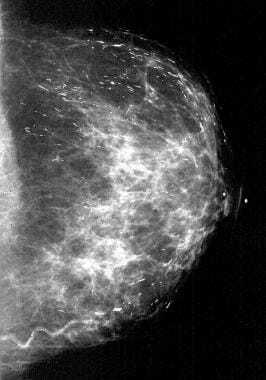 Comparing current mammograms with prior mammograms is essential to determine the stability of any calcifications detected. Finally, on the basis of the interpretation, the radiologist can make an informed decision about whether the calcifications identified are benign and do not require biopsy or whether the appearance of the calcifications warrants biopsy. Mammography is limited in evaluating benign calcifications when benign calcifications morphologically overlap with indeterminate or malignant calcifications. These calcifications may be observed for a short period (ACR BI-RADS category 3), or biopsy may be performed (ACR BI-RADS categories 4 and 5). For patient education information, see the Imaging Center, Cancer and Tumors Center, and Women's Health Center, as well as Mammogram, Breast Lumps and Pain, and Breast Self-Exam. Skin or dermal calcifications (see the image below) are usually identified as spherical, lucent-centered calcifications at the periphery of the breast, especially in the inferior, posterior, and medial aspects. [23, 24] Skin calcifications may develop from a degenerative metaplastic process. Usually, skin calcifications are readily distinguished as benign findings. However, in some cases, additional imaging is needed to differentiate skin calcifications from more worrisome calcifications. When mammograms are compared, calcifications that maintain a fixed relationship to one another are suggestive of a dermal location. Magnification views may be used to demonstrate the lucent centers characteristic of skin calcifications. In some cases, a skin localization procedure may be needed to prove that the calcifications are in the skin. When performing a skin localization procedure, the radiologist should determine if the calcifications are more likely to be in the upper or the lower portion of the breast. Thereafter, the patient's breast is placed in the mammographic unit by using a fenestrated compression device. For calcifications presumed to be in the upper part of the breast, a CC approach is used with the fenestration device in the region of the calcifications. For calcifications thought to be in the inferior part of the breast, a caudocranial approach is used. A metal marker is then placed over the calcifications, and a tangential view is obtained to show the dermal calcifications in the skin. Vascular calcifications (shown below) are commonly identified on mammography, especially in older women. Vascular calcifications, which are usually secondary to medial atherosclerosis, often demonstrate a characteristic train tracklike configuration. In some cases, it may be difficult to distinguish vascular calcifications from ductal calcifications (including calcifications representing ductal carcinoma in situ). 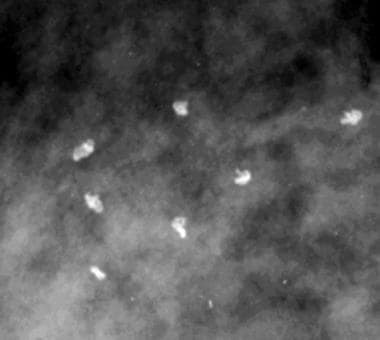 Arterial calcification in the breasts may be associated with diabetes and hyperparathyroidism. Scattered vascular calcifications with train track—like appearance (arrows). The presence of mammary vascular calcifications may allow for the detection of women with elevated cardiovascular disease risk profiles. [25, 26, 27, 28] Researchers in the Netherlands examined 12,239 women in a population-based breast cancer screening program. The study showed a significant correlation between vascular calcifications identified on mammography and myocardial infarction, transient ischemic attacks, and hypertension. Additional studies are needed to validate the potential role for screening mammography in the early detection of women at risk for cardiovascular disease. Lucent-centered calcifications, as depicted below, which are round or oval, are almost always benign and they have thicker walls than those of rim or eggshell calcifications. Skin calcifications are often lucent-centered, and lucent-centered calcifications may form around benign debris in the ducts. 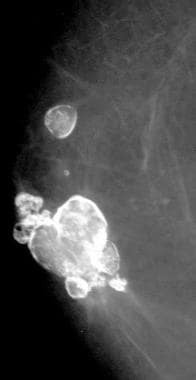 Other entities that may appear as lucent-centered calcifications on mammography include silicone granulomas and fat necrosis. This patient was in a car accident and sustained a seatbelt injury. The lucent-centered calcifications seen are typical of fat necrosis. This patient underwent breast-conserving surgery. The lucent-centered calcifications (arrow) are typical of fat necrosis. Multiple silicone granulomas are lucent-centered calcifications. Fat necrosis results from several causes including trauma, surgery, and radiation therapy. Fat necrosis occurs most often in fatty pendulous breasts of middle-aged women. Lucent-centered calcifications may result from fat necrosis, and the thickness of the calcified wall around the lucent area is variable and probably related to the amount of desmoplastic reaction. Eggshell or rim calcifications, shown below, are thin and appear as calcium deposited on the surface of a sphere. The walls of eggshell or rim calcifications are thinner than the walls of lucent-centered calcifications. Eggshell or rim calcifications (arrows) have walls thinner than those of lucent-centered calcifications. The entire circumference of an eggshell calcification does not need to be completely calcified to represent a benign finding. Although fat necrosis can result in eggshell calcifications, calcification in the walls of cysts is the most common cause of eggshell or rim calcifications. Coarse or popcornlike calcifications, as shown below, are associated with the involution and hyaline degeneration of fibroadenomas. Fibroadenomas are the most common breast masses seen in women younger than 35 years of age. This mass with associated large, coarse calcifications (arrows) is a degenerating fibroadenoma. Calcifications associated with fibroadenomas have been termed popcorn calcifications because of their large size and dense, coarse appearance. Calcifications in fibroadenomas usually begin at the periphery and then involve the central portion of the fibroadenoma. Fibroadenomas may be completely replaced by calcification without a mass discernible by mammography. Large rodlike or secretory calcifications (see below) are oriented along the axes of the ductal system. These calcifications result from calcification of ductal secretions. Large rodlike or secretory calcifications are oriented along the axis of the breast ductal system. Large rodlike calcifications may have lucent centers if the ductal secretions undergo peripheral calcification. In general, these calcifications are coarser and larger (usually > 1 mm in diameter) than malignant calcifications. Large rodlike calcifications are commonly bilateral and diffuse. These calcifications are associated with secretory disease, plasma cell mastitis, and duct ectasia. Punctate calcifications, like in the image below, are spherical calcifications that have well-defined margins. Scattered round and punctate calcifications (arrows). Punctate calcifications usually measure less than 0.5 mm in diameter. Round calcifications are benign spherical calcifications that may vary in size. When less than 1 mm, round calcifications are frequently formed in the acini of the lobules. Left, On the craniocaudal (CC) magnification view, milk of calcium appears poorly defined and smudgy (arrows). Right, On the mediolateral (ML) or the lateromedial (LM) magnification view, milk of calcium is seen as sharply defined, crescent-shaped, semilunar, curvilinear (concave up), or linear arrangements (arrows). 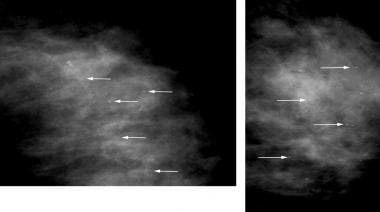 When milk of calcium is imaged with a vertical x-ray beam on the CC view, the calcifications appear poorly defined and smudgy. When imaged with a horizontal x-ray beam on the ML or the LM view, the calcifications are seen as sharply defined, crescent-shaped, semilunar, curvilinear (concave up), or linear arrangements. The characteristic appearance of the calcifications on the magnification views helps to establish the correct diagnosis of milk of calcium. Suture material (see the image below) may become calcified, resulting in suture calcifications. [32, 33] Suture calcifications are usually seen at a known surgical site, and the calcifications may be linear or tubular. Knots may be demonstrated. Suture calcifications are likely due to delayed resorption of catgut sutures, which can provide a matrix on which calcium can precipitate. Suture calcifications are more common in women who have undergone radiation therapy compared with those who have had benign breast biopsy. Radiation therapy results in delayed tissue healing, and it is likely that suture resorption is also delayed in the radiated breast, allowing for the precipitation of calcium in the catgut sutures. The earliest time at which calcified suture material may become evident on mammography is within 2 years of surgery. Dystrophic calcifications, as shown in the image below, may form secondary to trauma, surgery, or irradiation. This patient's breast was burned. The irregular, large calcifications are dystrophic. Most often irregular, dystrophic calcifications are usually larger than 0.5 mm, and they may have lucent centers. Borecky N, Rickard M. Preoperative diagnosis of carcinoma within fibroadenoma on screening mammograms. J Med Imaging Radiat Oncol. 2008 Feb. 52(1):64-7. [Medline]. Lehman CD, Rutter CM, Eby PR, White E, Buist DS, Taplin SH. Lesion and patient characteristics associated with malignancy after a probably benign finding on community practice mammography. AJR Am J Roentgenol. 2008 Feb. 190(2):511-5. [Medline]. Rosenberg RD, Yankaskas BC, Abraham LA, Sickles EA, Lehman CD, Geller BM, et al. Performance benchmarks for screening mammography. Radiology. 2006 Oct. 241(1):55-66. [Medline]. Sickles EA, Miglioretti DL, Ballard-Barbash R, Geller BM, Leung JW, Rosenberg RD, et al. Performance benchmarks for diagnostic mammography. Radiology. 2005 Jun. 235(3):775-90. [Medline]. Stephens TW, Whitman GJ, Stelling CB. Typical benign calcifications of the breast that do not require biopsy. The Radiologist. 2003. 10:1-9. Whitman GJ, Stephens TW, Hopkins K. Benign and malignant breast calcifications. Contemporary Diagnostic Radiology. 2002. 25:1-6. Choi YJ, Ko EY, Kook S. Diagnosis of pseudoangiomatous stromal hyperplasia of the breast: ultrasonography findings and different biopsy methods. Yonsei Med J. 2008 Oct 31. 49(5):757-64. [Medline]. Shin JH, Han BK, Ko EY, Choe YH, Nam SJ. Probably benign breast masses diagnosed by sonography: is there a difference in the cancer rate according to palpability?. AJR Am J Roentgenol. 2009 Apr. 192(4):W187-91. [Medline]. Masroor I. 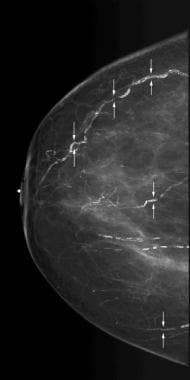 Effectiveness of assigning BI-RADS category-3 to breast lesion with respect to follow-up. J Coll Physicians Surg Pak. 2008 Apr. 18(4):209-12. [Medline]. American College of Radiology BI-RADS ATLAS and MQSA: Frequently Asked Questions. American College of Radiology BI-RADS ATLAS and MQSA. Available at http://www.acr.org/~/media/ACR/Documents/PDF/QualitySafety/Resources/BIRADS/BIRADSFAQs.pdf. Accessed: May 12, 2009. D'Orsi CJ, Bassett LW, Berg WA, et al. Breast Imaging Reporting and Data System: ACR BI-RADS-Mammography (ed 4). 4th. Reston, Virginia: American College of Radiology; 2003. ACR. American College of Radiology: Illustrated Breast Imaging Reporting and Data System (BI-RADS). 3rd ed. Reston, VA: American College of Radiology. 1998. Cardenosa G, Mendelson E, Bassett L, et al. 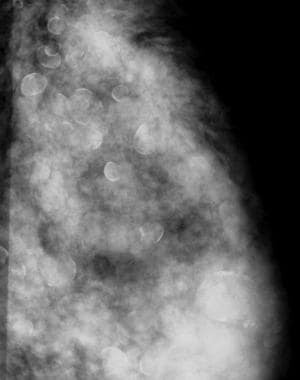 Appropriate imaging work-up of breast microcalcifications. American College of Radiology. ACR Appropriateness Criteria. Radiology. 2000 Jun. 215 Suppl:973-80. [Medline]. Homer MJ, Marchant DJ, Smith TJ. 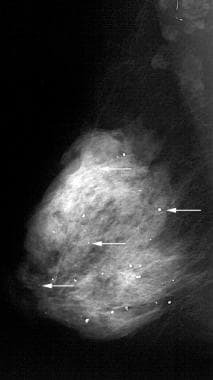 The geographic cluster of microcalcifications of the breast. Surg Gynecol Obstet. 1985 Dec. 161(6):532-4. [Medline]. Sitzman SB. 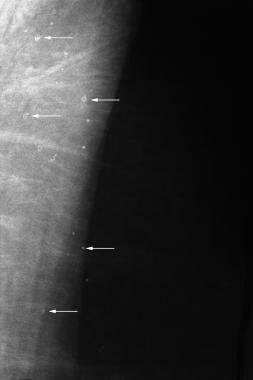 A useful sign for distinguishing clustered skin calcifications from calcifications within the breast on mammograms. AJR Am J Roentgenol. 1992 Jun. 158(6):1407-8. [Medline]. Bassett LW. Mammographic analysis of calcifications. Radiol Clin North Am. 1992 Jan. 30(1):93-105. [Medline]. D''Orsi CJ, Kopans DB. Mammographic feature analysis. Semin Roentgenol. 1993 Jul. 28(3):204-30. [Medline]. Hoeffken W, Lanyi M. Mammography: Technique, Diagnosis, Differential Diagnosis, Results. Philadelphia:. WB Saunders Co. 1977:261. Linden SS, Sickles EA. Sedimented calcium in benign breast cysts: the full spectrum of mammographic presentations. AJR Am J Roentgenol. 1989 May. 152(5):967-71. [Medline]. Sickles EA. Breast calcifications: mammographic evaluation. Radiology. 1986 Aug. 160(2):289-93. [Medline]. 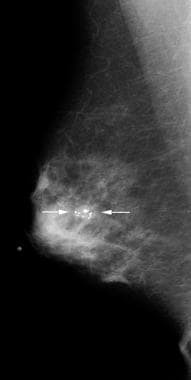 Baldwin P. Breast calcification imaging. Radiol Technol. 2013 Mar-Apr. 84(4):383M-404M; quiz 405M-408M. [Medline]. Craft M, Bicknell AM, Hazan GJ, Flegg KM. 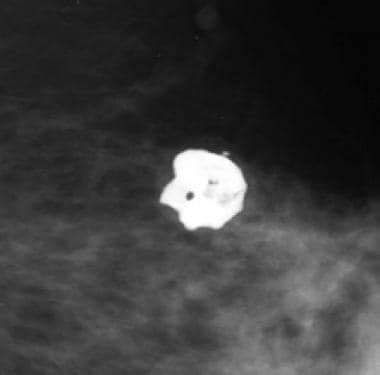 Microcalcifications Detected as an Abnormality on Screening Mammography: Outcomes and Followup over a Five-Year Period. Int J Breast Cancer. 2013. 2013:458540. [Medline]. Berkowitz JE, Gatewood OM, Donovan GB, Gayler BW. 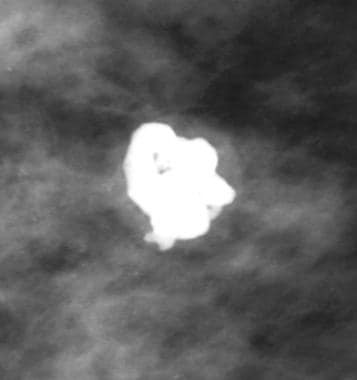 Dermal breast calcifications: localization with template-guided placement of skin marker. Radiology. 1987 Apr. 163(1):282. [Medline]. Kopans DB, Meyer JE, Homer MJ, Grabbe J. Dermal deposits mistaken for breast calcifications. Radiology. 1983 Nov. 149(2):592-4. [Medline]. Molloi S, Xu T, Ducote J, Iribarren C. Quantification of breast arterial calcification using full field digital mammography. Med Phys. 2008 Apr. 35(4):1428-39. [Medline]. Kataoka M, Warren R, Luben R, Camus J, Denton E, Sala E, et al. How predictive is breast arterial calcification of cardiovascular disease and risk factors when found at screening mammography?. AJR Am J Roentgenol. 2006 Jul. 187(1):73-80. [Medline]. Rotter MA, Schnatz PF, Currier AA Jr, O'Sullivan DM. Breast arterial calcifications (BACs) found on screening mammography and their association with cardiovascular disease. Menopause. 2008 Mar-Apr. 15(2):276-81. [Medline]. Maas AH, van der Schouw YT, Atsma F, Beijerinck D, Deurenberg JJ, Mali WP, et al. Breast arterial calcifications are correlated with subsequent development of coronary artery calcifications, but their aetiology is predominantly different. Eur J Radiol. 2007 Sep. 63(3):396-400. [Medline]. Hendriks EJ, de Jong PA, van der Graaf Y, Mali WP, van der Schouw YT, Beulens JW. Breast arterial calcifications: a systematic review and meta-analysis of their determinants and their association with cardiovascular events. Atherosclerosis. 2015 Mar. 239 (1):11-20. [Medline]. Tantisattamo E, Han KH, O'Neill WC. Increased vascular calcification in patients receiving warfarin. Arterioscler Thromb Vasc Biol. 2015 Jan. 35 (1):237-42. [Medline]. Sickles EA, Abele JS. Milk of calcium within tiny benign breast cysts. Radiology. 1981 Dec. 141(3):655-8. [Medline]. Davis SP, Stomper PC, Weidner N, Meyer JE. Suture calcification mimicking recurrence in the irradiated breast: a potential pitfall in mammographic evaluation. Radiology. 1989 Jul. 172(1):247-8. [Medline]. Stacey-Clear A, McCarthy KA, Hall DA, et al. Calcified suture material in the breast after radiation therapy. Radiology. 1992 Apr. 183(1):207-8. [Medline].